If you are using Sony Xperia M, then your device might be running Android 4.1(Jelly Bean) or Android 4.3(Jelly Bean). As you may know that Sony haven’t rolled out Android 4.4(Kitkat) update for Xperia M. So we should not expect Android 5.x(Lollipop) update. 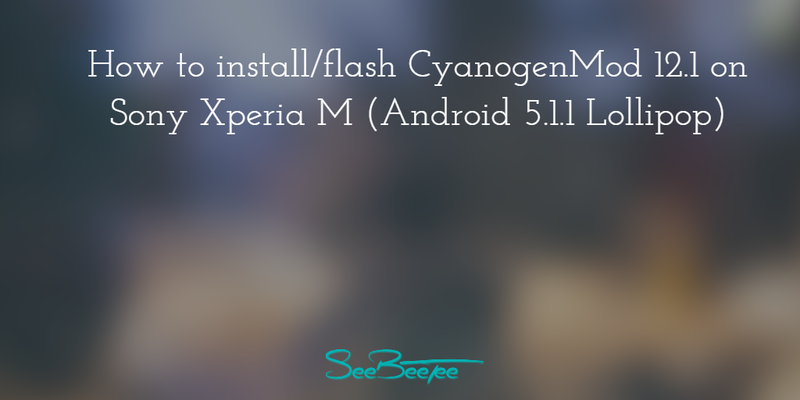 In this tutorial, I am going to show you how to install/flash CyanogenMod 12.1 which is based on Android 5.1.1 Lollipop on your Sony Xperia M.
Here is the XDA thread from the PecanCM who is contributor of the custom ROM which we will install in Sony Xperia M.
Take backup of everything in your phone. E.g. Contacts, Messages, Apps, etc. This is a nightly build. So you may come across some bugs. Make sure Your device battery is greater or equal 80%. Either your device may breakdown. Your device’s warranty is now void. You are choosing to install this ROM, So do the whole process at your own risk. We are not responsible for any kind of damages at all. I am not assuring you that you’ll 100% get your device working with Android 5.1.1 Lollipop(CM 12.1). Note here that You’re installing everything new so, Probably nothing will remain from 4.3, Thus Backup should be necessary. Make sure your Xperia M connected to your computer with USB Cable and USB Debugging is enabled(checked). Go to Settings -> About phone -> Tab near 7 times on Build number. After doing above process, you shall see confirmation by that toast message saying You are now a Developer! Go back, Tap Developer options -> Enable that button on the top-right if it’s not -> Check USB debugging in Debugging section. Click on that OK button in alert which will showing details regarding what is USB debugging. Now open CMD (Command Prompt). Type adb devices. Press Enter. If your device is being shown in List of devices attached then you are good to go. If not shown, try to reinstall program/Check that USB debugging is successfully enabled on your device. Or just write down the error in comment section below this post. Download Flashtool from here. Install it on your computer. Download CWM recovery from here. Rename it to “boot.img”. Open this link. Click on the first link after “Direct Download:“ The link text would be like cm-12.1-YYYYMMDD-NIGHTLY-nicki.zip. 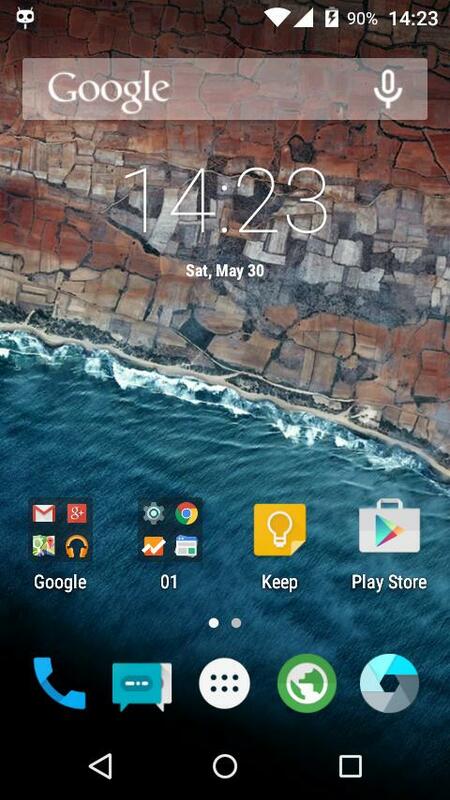 Download Android 5.0 Google Apps from here. File name would be like gapps-lp-YYYYMMDD-signed.zip. Now your device is on fastboot mode so we can install recovery now. (The blue light may be seen on your Device) Click on Select kernel to Flash in Flashtool. Select *.img in file types. Select that boot.img file which you’ve downloaded in Step 2. Click Open. It’ll show you the CWM interface, Navigate to wipe data/factory reset via Volume buttons. Press the Power button to select. Navigate to Yes – delete all user data, select it via Power button. It’ll be done in near couple of minutes. After completion of above step, Now you will be again in CWM interface, navigate to wipe cache partition, press Power button to select. Navigate to Yes – Wipe Cache, select it via Power button. After completion of above step, You’ll be again in CWM interface, Now it’s time to flash the actual CM 12.1 ROM and gapps. Now connect your device to the computer via USB cable (if not). In your device, Navigate to install zip, select it, Navigate to install zip from sideload, select it. Navigate to the folder(on your computer) which containing CM 12.1(.zip) and gapps(.zip) files. (which you’ve downloaded in Step 3,4) Shift + Right click in the blank space in the folder window. Select Open command windows here. Type adb sideload cm-12.1-YYYYMMDD-NIGHTLY-nicki.zip, press Enter. This will sideload the file to the device and after 100% completion of this transfer, The installation of CM 12.1 will begin in your device. After installation completes, go ahead. Now you may see CWM interface or install zip interface. If you’re in CWM interface, Navigate to install zip and select it. If you’re in install zip interface, Navigate to install zip from sideload, select it. Type adb sideload gapps-lp-YYYYMMDD-signed.zip, press Enter. Again it’ll sideload the file to the device and after 100% completion of this transfer, The installation of Google Apps will begin in your device. So after the installation of gapps, If you’re in install zip then go back to CWM interface or if you’re in CWM interface then select reboot system now. It may ask you for the “root fix”… You should select Yes. Now your device will reboot, It may take up to 15 minutes (first time reboot), So I suggest you to take a cup of coffee/tea with you while the device boots up. After finishing the start up guide, Congratulations, Your device is running Android 5.1.1 (CM 12.1). Note: The file name after adb sideload will depend on your downloaded file so be aware that you’re typing the name which your downloaded file have. Is it necessary to unlock boot loader before performing this procedure? Is it necessary to unlock boot loader before performing the procedure. because i get an error- device not connected in adb mode. what does this mean? I've installed the ROM without unlocking boot-loader in Xperia M and it worked. It seems like you're getting the error because Your computer can't recognize your device. To solve this, try reinstalling/repairing your computer adb and usb drivers. And make sure to attach your Mobile Device via USB Cable directly to the Computer. Don't use USB hubs. And if possible, only attach your device with the provided USB Cable. If your computer don't recognize the device in first try then try reattaching, It should work. And re-read the article to confirm that you don't missed any step. If problem persists, don't hesitate to reply. thank you so much, bro. I've installed the Cyanogenmod 13.0 because of you! I have installed CM recovery,but when i try to wipe data/factory reset it gives the error. Phone can not wipe data. Please help me..!! Sorry to know that Keyur. I don't really use the CM recovery but I mostly use TWRP/CWM … So try installing TWRP/CWM and try to wipe the data. If this doesn't work, please let me know. And be careful while installing recovery because sometimes it leads to bootloop/have to install the ROM from scratch. Sir, thank you for this post. But I'm very new to this kind of thing and I just wanted to flash lollipop on my XPERIA M c1905, the version is Android 4.1.2, and when I get to steps 6, flashtool just keep saying command not allowed. What i've missed? I didn't bother unlocking the bootloader. Command may not be allowed because your device may not be in fastboot mode, try doing every steps from beginning and it should work. In my experience, I've never unlocked the bootloader. "WARNING: The data being saved is truncated to 1024 characters. I would suggest you to try running some adb commands in your CMD and let me know if they're working. Because this warning doesn't seems to be related to ADB drivers. driver error do i ignore that ? or not? Make sure that you're following every step mentioned in the article and you've installed necessary drivers in your Computer. Try doing the process again from Step 1 and let me know what happens.